It's a double update this week. 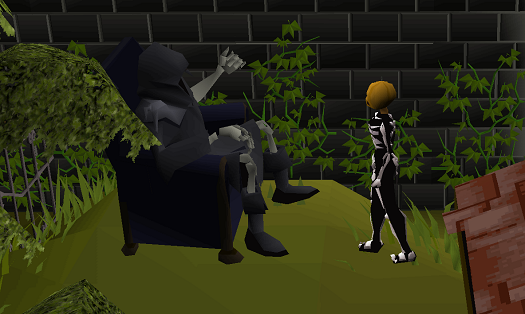 Halloween is upon us, and the Grim Reaper has come to Lumbridge to seek your aid. Besides that, the long-awaited Make-All update has arrived, bringing a highly demanded usability update to all the Make-X menus throughout the game. Death is no stranger to spooky goings-on, and he normally ain't afraid of no ghost, but some recent disturbances are causing him real concern. It'd be enough to bring a wrinkle to his forehead, if he actually had any skin there. You'll find him in Lumbridge Graveyard, waiting for an adventurer to investigate the matter. It's not going to be easy, though - this might be the most challenging holiday event we've done so far. Prepare for a truly horrific tale of murder, vengeance and undying evil, as you solve the puzzles of the desolate cabin in the woods of Camp Sapphire Lagoon, and confront your foe in the depths of the sinister lake. If you can overcome all that, you'll unlock all the prior years' Halloween treats - skin colours, player-owned house style, items and music tracks - and also earn yourself a truly spoopy mask and another ghastly skin colour. So head down to Lumbridge Graveyard now to get started. The Halloween event will be in the game for at least 2 weeks. If you don't complete it in that time, you'll be able to get its rewards as usual next Halloween. Back in late June, we offered some changes to the Make-X interfaces used across the game, adding Make-All options, and converting the generic menu to use left-clicks and keyboard short-cuts. This wasn't a small job, as you can imagine, trawling through the spaghetti of legacy code to rewrite 207 skilling features around the new menu. Besides those, there were numerous custom menus needing individual updates too, such as anvil smithing, glassblowing and spinning wheels. Once you've selected the quantity you want to make, click on your chosen item to start the process. Keyboard short-cuts can be also used to trigger the item buttons. If you're bringing up the same menu repeatedly, the game will try to remember what quantity you chose last time so that it can pre-select the quantity for you. Otherwise it'll default to 'All'. Where there's only one option, and the game realises you've only got enough ingredients to make 1 of it, it'll aim to start the process immediately without bringing up the menu at all. Not every skilling feature in RuneScape had a Make-X option before; they therefore haven't received a Make-All option now. For example, when you're adding arrowheads to headless arrows, the menu used to offer only Make-1, Make-5 and Make-10; it's now been updated to the new style so you can operate it via left-clicks and keyboard short-cuts, but it still offers the same quantity options. 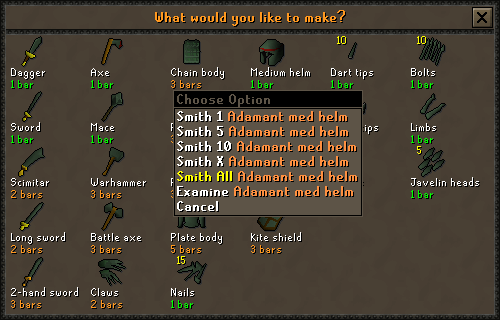 Similarly, some features such as fletching darts or enchanting bolts never had any options for making multiple batches at once; they've not been changed in this update either. Rewriting literally hundreds of skilling features is not straightforward, and it brings the risk that we got something wrong along the way. If so, just right-click the Report button to get your bug reports straight to the testers, and we'll go take a look. 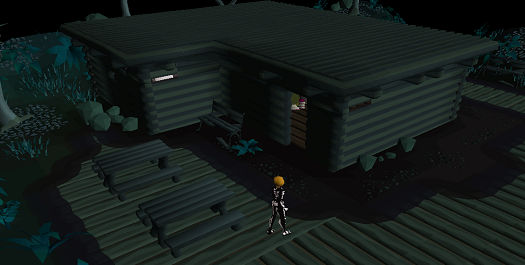 40% more Woodcutting XP is now given from chopping sulliuscep mushrooms. Although our poll systems are once again able to run polls, courtesy of the web team, the game is no longer attempting to load the entire poll history; we have adjusted the in-game poll history display accordingly. Old poll totals can still be viewed on the website. A skeleton in the Temple of Ikov was spawning on top of a pointy stalagmite. Ouch? The 'Empty' option on ultracompost buckets now works. The use of commas is now more consistent when checking the charge of a blowpipe. Some typos in Varrock Museum cases have been corrected. 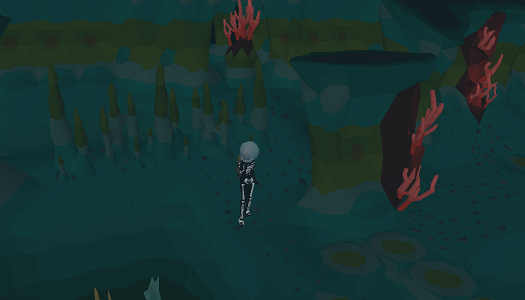 The Corporeal Beast's cavern entrance now allows exit if you have a pet out, but still does not permit entry with a pet. Poll 57 is opening imminently. You’ll be offered 2 new quests to continue the story from Client of Kourend, as well as the chance to buff Ahrim’s staff. Also included are the long-awaited Wooden & Leather shields, the long-range rock hammer (Roq's weapon of choice against gargoyles) and the opportunity to #DitchtheDitch. The Deadman season ends next Thursday 26th October. Have a read about the plans for the Winter Finals, featuring a second 'final area', supply chests and a 7-stage series of 1v1 fights across 64 islands for the last 128 players standing. Finally, the intended release date for Dragon Slayer II has been announced: it's aiming for Thursday 4th January 2018. There'll be a design stream at 1pm BST (noon UTC) on Thursday 26th October on our official Twitch channel so you can see how it's looking so far.